This entry was posted in General Election 2017 and tagged General Election 2017, Rother Valley Constituency, Rotherham Constituency, Wentworth and Dearne Constituency by Rik. Bookmark the permalink. Is UKIP in Rotherham Finished. Between them Both Allen Cowles and Lee Hunter could only manage 7020k votes for both Rother Valley and Rotherham constituencies placed now in Third Place whereas second last general election 2015. 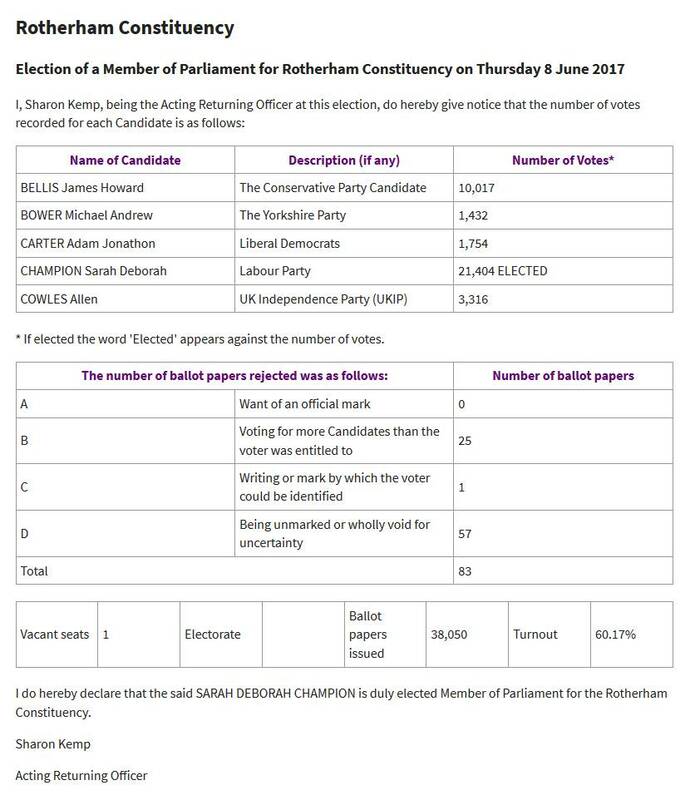 In Rotherham Allen Cowles only secured 3,316k votes, in 2015 Jane Collins secured a vote of 11,414 losing well over half the vote by 8.098 this time and still no Leaflet or communication from Allen Cowles. Labour’s Champion increased her vote share by 1,544 votes and the Tory’s also increased their vote by half this time round by 4,645 votes. 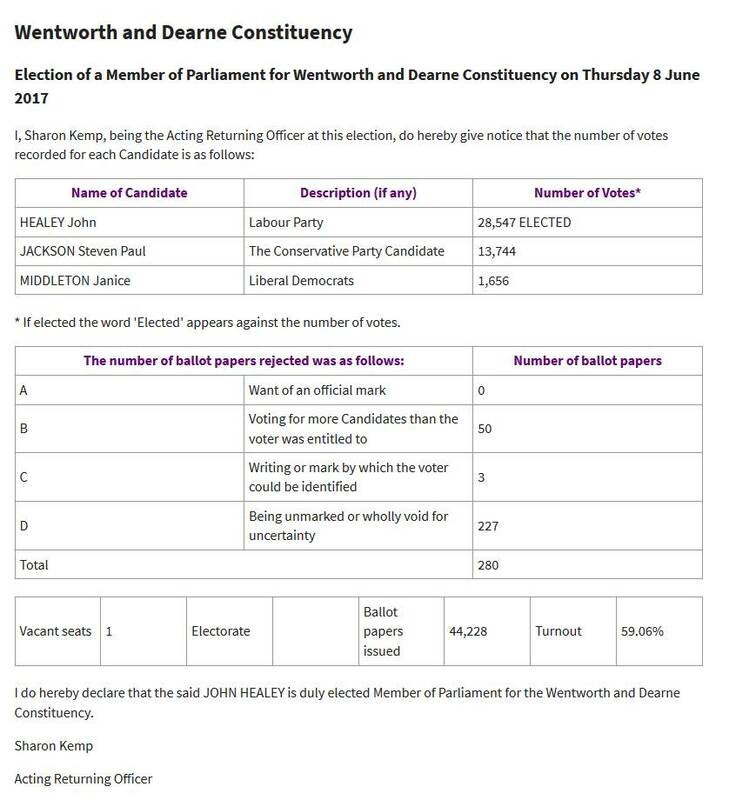 In Rother Valley Lee Hunter only secured 3,704k votes, in 2015 Allen Cowles secured 13,204 losing well over half their vote by 9.5k votes. We could say the UKIP vote went to the Tory’s with the candidate this time securing 19,939k votes with the candidate last time getting 10,945 only time will tell. Barron increased his vote receiving 23,821 this time compared to 20,501 an increase by 3.320 votes nearly more than the UKIP and Lee Hunters vote overall. Looks also like the most campaigning both Lee and Allen did was stand at the road side holding “vote UKIP” banners looking on their respective social media activities. Did the UKIP Vote go to Tory’s or is UKIP now finished in Rotherham only time will tell? You ‘forgot’ to mention that Sir Kev’s majority is now only 3,882 which is approximately half of his 2015 majority. It was primarily due to ex-UKIP (down 20.6%) voters voting Tory (up 17.0%). It’s not surprising that UKIP did terribly in this election. Nigel Farage criticised the party for not having the organisational infrastructure to run a snap election campaign (though that was surely his responsibility as long-term leader). Without any credible detailed policies or effective campaigning the purple vote naturally returned to its red and blue parts. The number of votes for UKIP nationally isn’t pitiful. We can only wonder how more candidates might have influenced overall results. A greater worry must be in places like Wentworh and Dearne where UKIP really hasn’t done anything to store up good will. Not dead but in desperate need of policies, local leadership, then real central leadership (not Farage) and much more work put into promoting those before the next election. Mr Nuttall insisted Ukip still had a future in post Brexit politics but fell on his sword after the party lost its one and only Commons seat. Mr Arnott described how, in his role as general secretary, he was “powerless” to act against those who “expressed vile racist views”. Mr Arnott appears to have some rather divisive views of his own. “The Ukip’s Christian North East MEP has told Premier the party’s manifesto launched today appeals to Christians. It follows the election campaign suspension put in placer after the Manchester terror attack. Speaking during News Hour, Jonathan Arnott said that the party’s referendum policy will give Christians an opportunity to change things linked with moral issues such as the death penalty. .. but I guess that is quite a mild expression of bigotry, when the Tories are trying to get into bed with the creationist, climate change denying, anti-abortion, anti-gay, young-earthers with close links to NI loyalist pararmilitary groups, political party known as the DUP. As to the possibility of UKIP surviving; I find it hard to call – so much depends on just how the Tories handle the next few months. The UKIP Party campaign team need to go, they went into bed with the Tory’s and it failed. After a really bad delivery of some good ideas UKIP need to re think their way of doing things. A clear out of all those who advised Nuttall and were responsible for the totally inept party campaign. Appointment of the wrong people to the wrong jobs and the control of the mixed messaging leaving voters and candidates unsure what they should be doing and what UKIP now stood for. Having watched the campaigns in by elections including the Stoke by-election allowing the same people to tackle the general election was just plain stupidity. Suzanne Evans, Partick O’Flynn, Tim Aker, Paul Oakden, Steve Crowther, Lisa Duffy, Peter Reeve and Peter Whittle, just about all the campaign UKIP campaign team they have less election experience between than a rookie parliamentary candidate. It’s okay for the Leader Nuttall to go, but what about those still left. If Theresa May and her Tory government now do a U-Turn on their promise of ‘no deal is better than a bad deal’, then the only ones that are responsible for that happening are UKIP, for their total incompetence since June 23rd 2016. They should have reformed and rebranded straight after instead of all the in fighting. If it had not been for careerist like Suzanne Evans and the rest of those in #TeamSensible who have only been looking out for themselves rather than the party and this country, UKIP could have so easily been were DUP are now and would have been able to use that position to ensure we get the kind of Brexit we voted for. For those shouting that UKIP needs Nigel Farage back at the helm, they obviously do not have any idea who was responsible for bringing in those career politicians after UKIP won the EU elections of 2014. UKIP’s best ever election result. Well that was all down to Nigel and his henchman Steve Crowther who has just decided to place himself as temporary leader of the party because Paul Nuttall has realised he is not up to the job. Boston was UKIP’s best chance of winning a seat until Nuttall decided he was going to stand there, after his poor performance in Stoke he never stood any chance of winning there! Another good chance UKIP had was Tim Aker and he did gain over 10k votes but UKIP should have thrown the kitchen sink at the Thurrock seat. MEP Bill Etheridge handed Labour the Dudley North seat on a silver platter by standing, Labour beat the Conservatives there with less than 100 votes, Bill had no chance of winning that seat and could have easily stood somewhere were he had a far better chance but no he wanted to stand on home turf. I seriously cannot see the logic in UKIP’s thinking in GE2017 and I can’t see how UKIP can ever recover now, especially telling their members and voters to vote Tory, that was a stupid idea because it now means their 4 million vote count is down to 600k and that means they have thrown away all the media appearances the 4 million allowed them. OfCom regulate on vote share not number of MPs, so well done Paul Nuttall you even got that one wrong as well. I am sure some UKIP die hards will tell me how I have got it all wrong but from what I can see, UKIP well and truly blew there chances and I don’t think that even ex leader candidate John Rees-Evans Direct Democracy plan can save it now, the hole in the UKIP ship is simply too big and it will sink regardless. UKIP had racked up more than £30,000 in lost deposits by 3am and I bet non one UKIP candidate has received a sorry for lack of support from UKIP HQ. UKIP has now also slumped from 3.88 million votes to just under 600,000. The party has fallen from 3rd to a distant 5th but managed to beat the Greens. 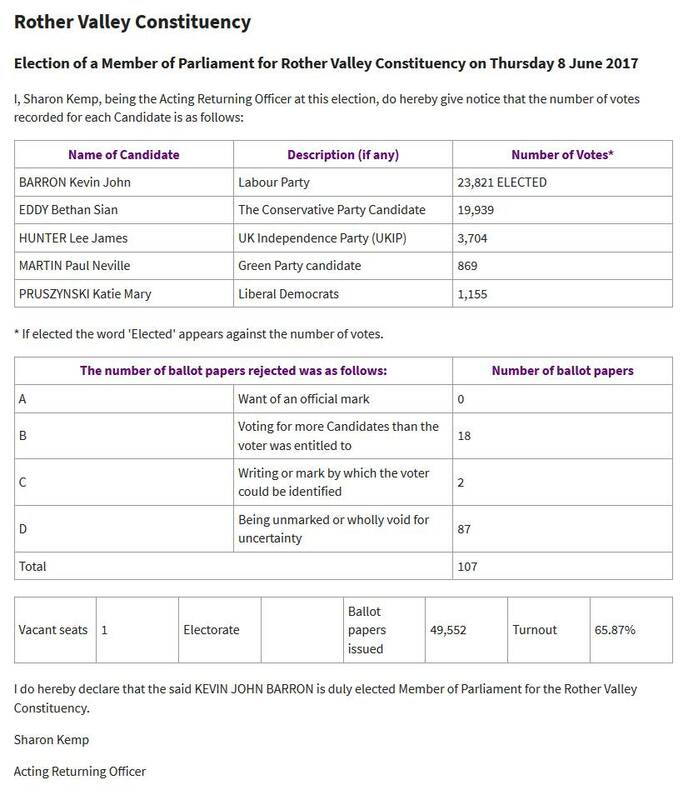 The UKIP vote stood up quite well in Rother Valley at 7.5%, if the campaign had been much better thought out and then campaigned strongly that figure would have been much higher. The Tories could have won this seat if they had selected a candidate who lived here, was on the Vote Leave side and had some great life experiences to back up their candidacy. I won’t back any Labour or Tory candidate who is not a strong leaver, has their first home in our constituency and will fight for our constituency because it is in their blood. Compared with Allen Cowles 28.1% in 2015??? ?